My favorite fish fry in the Cleveland area is without a doubt St. Gabriel’s in Mentor. It runs from 5:15 to 7:30 every Friday during Lent. Located in its school building on Johnnycake Road near the Concord border, it is a bit of a hike, but it is so worth it. There is a sign indicating the entrance. 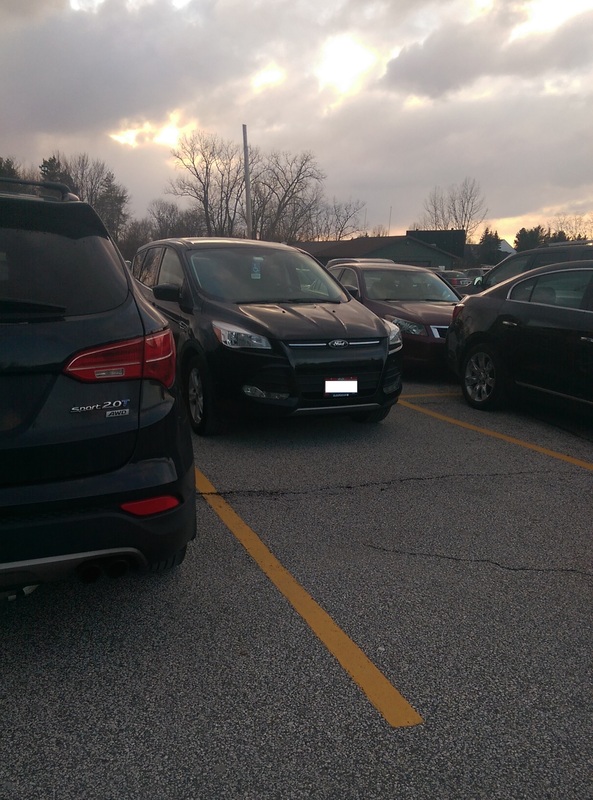 Plan to walk far from and to your car, but there is plenty of parking (even with douchebags taking up two parking spots). 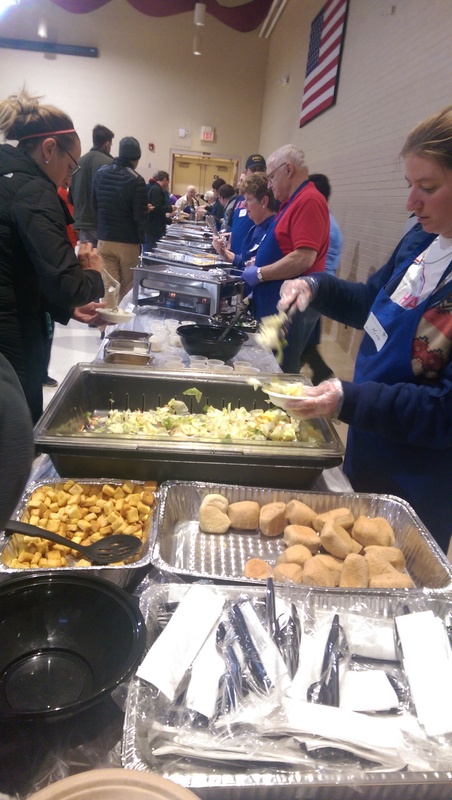 It is run by over 100 volunteers each night, including adorable tykes in Boy Scout uniforms manning the roving garbage cans, and all proceeds benefit the St. Gabriel’s Day School Tuition Assistance Program. It is extremely popular, so you need to get there early to ensure you get served and can enjoy all the goodness. Some friends went last week at 7 PM and were turned away because they had run out of food. This all-you-can-eat feast will run you $14. They also offer take-out and ala carte items. Click on the link below under “Contact info” for the Fish Fry page on the church website. 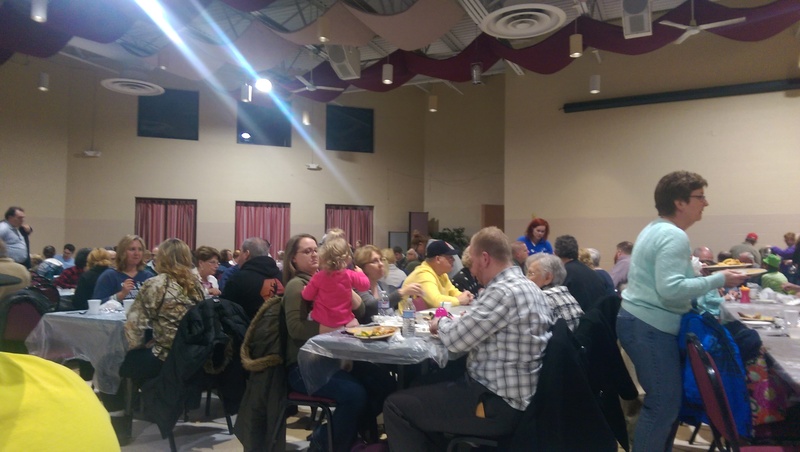 There are two dining rooms – the main dining room has a shorter line between the cash table and the food, so we chose that one this year. We got there at 6 PM and were in line for about 20 minutes until we were sitting down with our plates. I needed to save six seats, so I jumped out of line to reserve them right after six together cleared and were cleaned off. 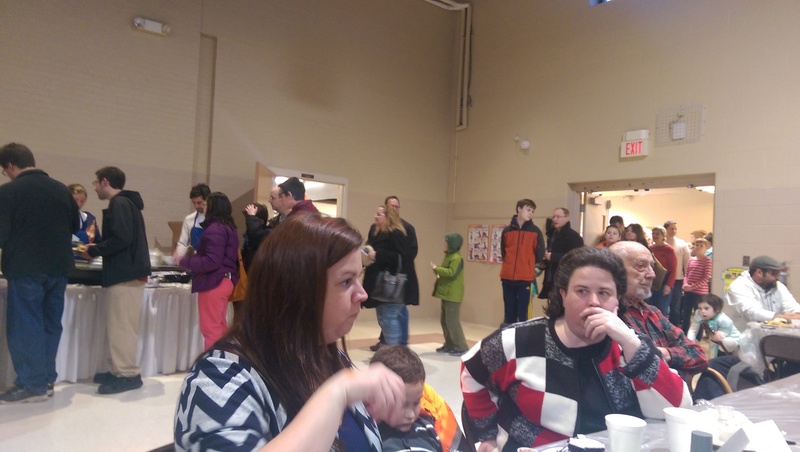 The gymnasium has no line for the cash table, but the line for the food circles the room. We waited in line for 45 minutes last year. There is more seating, but also more people. There is a lot of food to choose from, so I was extra judicious this year. 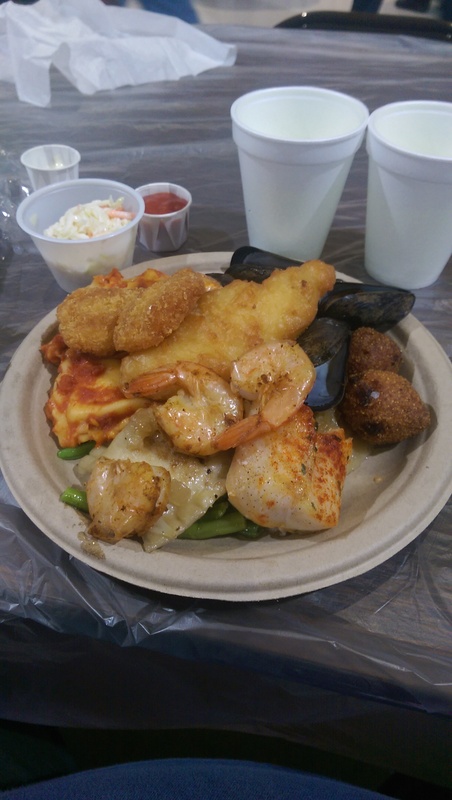 I eschewed most of the carbs and saved room for the fish and mussels. Let me see if I can remember everything on offer… starting with salad, cole slaw, applesauce and rolls and butter (which I somehow overlooked), then moving on there were baked potatoes, french fries, mac n cheese, cheese ravioli, fresh green beans in butter, pizza (always popular with the kids), hush puppies, and cheese pierogi, fish choices included baked tilapia, fried cod, baked cod, butter crumb baked cod, mussels, breaded cocktail shrimp and peel-and-eat shrimp and at the end was a pot of seafood chowder that ran out just as I got there. I tried to keep an eye out for when it came back out, but they ran out of it fairly early. They always do. There was a small table in the corner with tartar sauce and cocktail sauce. They ran out of tartar sauce several times. Beverages were along another wall, including tea and coffee and unsweetened ice tea, lemonade or ice water. Dessert (on the same table as the beverages) was chocolate or white cake, which ran out by the time I went back for some. Grab it when you can! They eventually brought out a tray of brownies, which were excellent, and when that ran out they brought out orange slices right at the end. I don’t know who makes the food, but every single item is great. 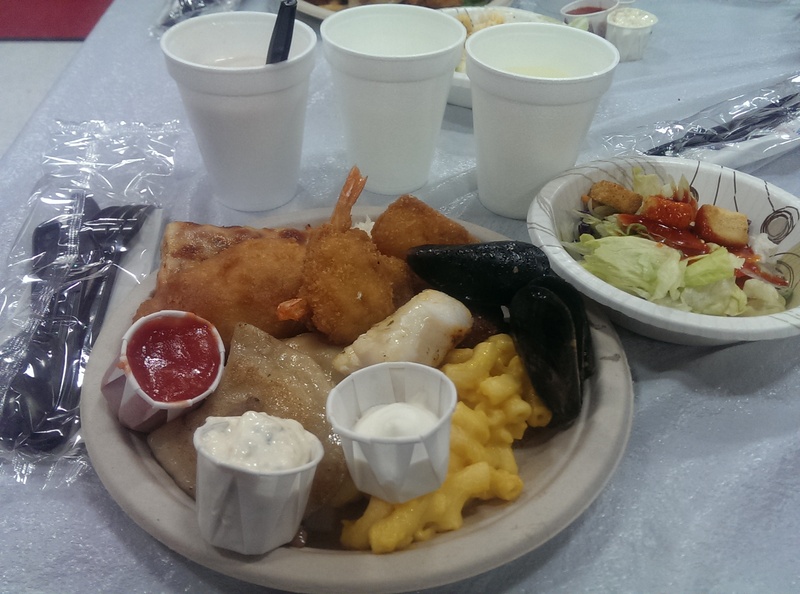 This year I asked for extra mussels and stuck to the battered and baked cod and the shrimp. Like I said, I skipped most of the carbs, but I did get some ravioli and pierogi (because it isn’t a fish fry in Cleveland without pierogi). 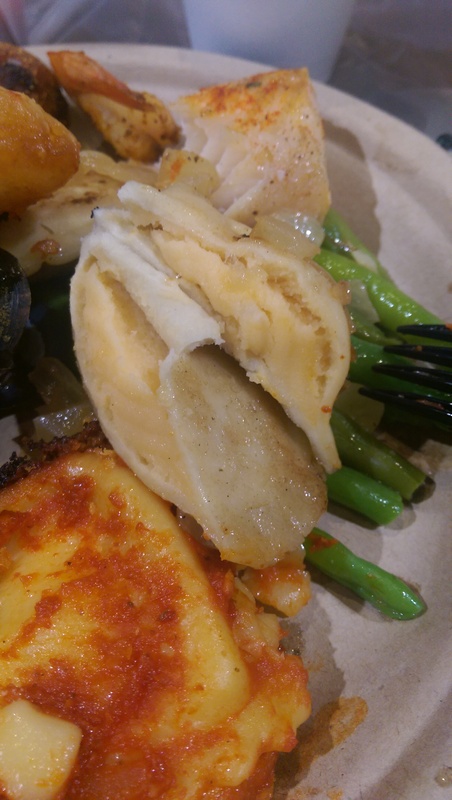 The pierogi were extra cheesy and well-cooked. The dough was moist and nicely steamed. They had some sauteed onions as an accompaniment. I also really enjoyed the green beans.